At the sources of Western civilisation, themselves its main source, stand two poems on the grand scale which for sustained beauty and splendour have found no superior, perhaps no equal, in all the poetry that has followed them. This is the most remarkable fact in the history of literature. 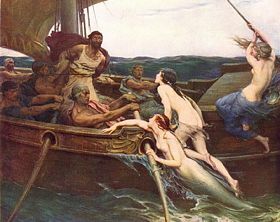 ‘Odysseus and the Sirens’. Herbert James Draper, 1909. Ferens Art Gallery, Hull. “The Odyssey is Homer’s story of the return of Odysseus from the Trojan War to his palace on the island of Ithaca and his battle to regain the kingship there after a long absence. The Iliad describes certain events towards the end of this war which is believed to have taken place in the 12th century BC. 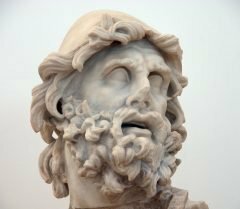 Although these poems are thought to have been set down in writing several centuries later, the Iliad and the Odyssey nevertheless represent two of the world’s oldest surviving texts. These are long epic poems of magnificent style and breathtaking sophistication. They were pivotal in defining the language and culture of classical Greece and these in turn have fundamentally influenced the development of Western Europe. Many aspects of our own spoken and written word, democracy, philosophy, politics, mathematics, architecture, painting, sculpture, drama and other facets of Western culture derive from the Greek civilisations of the 5th and 4th centuries BC. The Greeks regarded Homer as their teacher and the Homeric poems made an immense impact upon the whole of ancient literature. Socrates, Plato and Aristotle studied the Iliad and the Odyssey as a precursor to the development of their own ideas and for the last 2,500 years the Homeric poems have been required reading for every serious writer and philosopher. Homer’s Troy from the Iliad was located by Heinrich Schliemann on the north-western coast of Turkey and has been extensively excavated since the 1870s. But Homer’s Ithaca from the Odyssey has remained an enigma – until today. The Perseus Digital Library contains an online copy of the Greek text of the Odyssey and also A.T. Murray’s 1919 English translation. One of the most popular is Robert Fagles’ 1996 translation, ISBN 0140449957. The translations used on this website and in Odysseus Unbound are by James Diggle. Appendix 4 of Odysseus Unbound reviews 22 previous proposals for the location of Ithaca dating back from the time of Strabo (c. 1 AD) to the present day. The authors of these theories are: Strabo, Spon & Wheler, Gell, Leake, Gladstone, Schliemann, Partsch, Bérard, Volterras, Vollgraff, A E H Goekoop, Dörpfeld, Rennell, Korkos, Luce, Symeonoglou, C H Goekoop, Tsimaratos, Livadas, Cramer & Metaxas, Le Noan and Tzakos. We urgently need to raise £125,000 to complete our current research. Your donation will change the world's understanding of one of Western civilisation's founding stories.